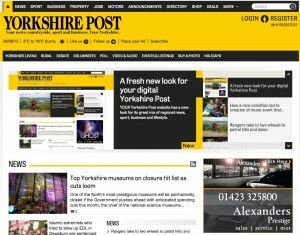 The Yorkshire Post has completed a redesign of its website, with updated navigation and more online features. The alterations have been made following a research programme with readers, where they provided feedback about the previous version of the site. “I’m delighted to be able to offer this significantly improved experience for our desktop website users,” said editor Peter Charlton, who will be stepping down later this year. “I really believe our new-look site will help our audience to find and enjoy our great online content and services. The digital edition of the paper now includes a new What’s On section; a scrolling Picks of the Day banner next to each story and an improved video player. It’s also promoted Tweets, offers and services to make them more prominent.